Completely empty your pockets, including coins, tissues, and paper – you know like when you are doing laundry. Make them laundry ready. 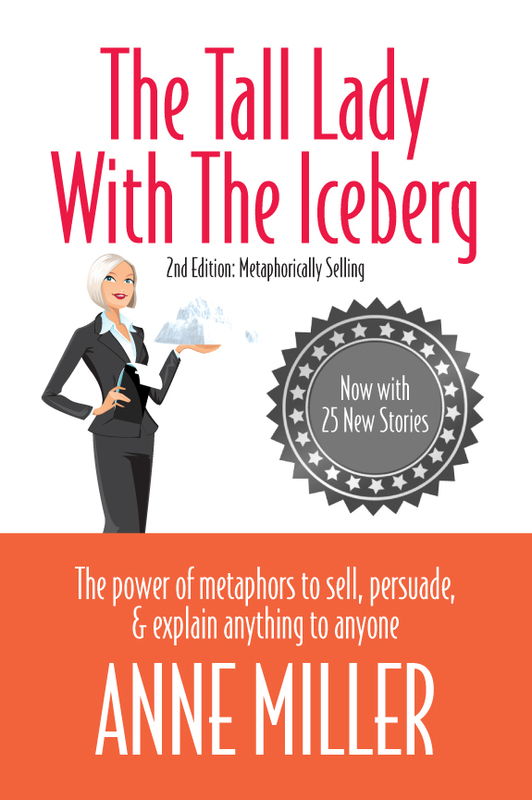 Immediately I thought, “That’s a powerful metaphor!” It was clear he meant everything – and it reminded me of Anne Miller, the author of The Tall Lady with the Iceberg which is an expanded version of Metaphorically Selling – a GREAT book on how to make a point and educate people to ‘see’ what your message. I’m please that Anne has written the following for me to share with you! We live in a time of an abundance of choices, information overload, limited attention, and unprecedented time pressure. As a survival mechanism, people are more likely to tune you out than in. You can talk to clients across the country on your cell phone, but it is often very difficult to get your point across just talking in the same room. As you scramble for every new way to make your point and create agreement, there is one overlooked tool that you can use to win the day–-visual language. We notice images. We remember in images. We have emotional reactions to images. We make decisions based on images. We talk in images. From early caveman drawings to today’s Pinterest, mankind has always reflected this primal reach for images to communicate. Sometimes, the images are actual pictures. Other times, they are expressed in language that is vivid and pictorial, which creates mental images for listeners. It’s Not What You Say. It’s What They See. Deb and CEO Mackey figured out that the way to make a point most efficiently and most memorably was with visual language. That means metaphors, analogies, and stories (can also include cartoons and props used metaphorically). What is done imaginatively by poets (“All the world’s a stage”) and said casually in conversation (“That’s a train wreck waiting to happen”) now needs to be done intentionally and strategically in business to get results, whether getting a job, selling a product, simplifying complex issues, rallying a team, or even running a country. Indeed, anyone who manages, sells, interviews, networks, blogs, or leads needs to speak visually to listeners. Visual language not only resonates, engages, and sticks in our memories, it also plays directly into how our brains process information and make decisions. Communicating without visual language is like attempting to drive a Ferrari without gas. No matter how attractive your ideas may be, you won’t get very far. This craft is not easily mastered. It requires expert communication skills, whether orally or in writing. I completely agree word pictures are powerful tools. Poorly executed, it can impugn your credibility. Poorly timed, can make you come across as condescending. 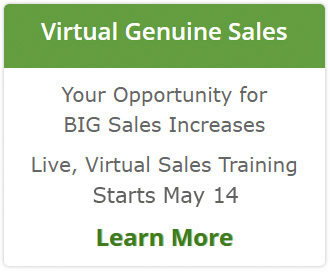 In a way it is like using humor in sales. If it doesn’t come naturally to you, if you aren’t funny when you are not working, don’t try it. These are high-reward tactics that come with high risk. But, you can practice (with colleagues, family), you can study (listen to storytellers and poets read) and watch Jon Stewart. Self-deprecating humor can do much to set a prospect at ease. Like most anything else, if you are willing to study, listen and work hard at something that doesn’t come naturally to you, you can improve upon it.